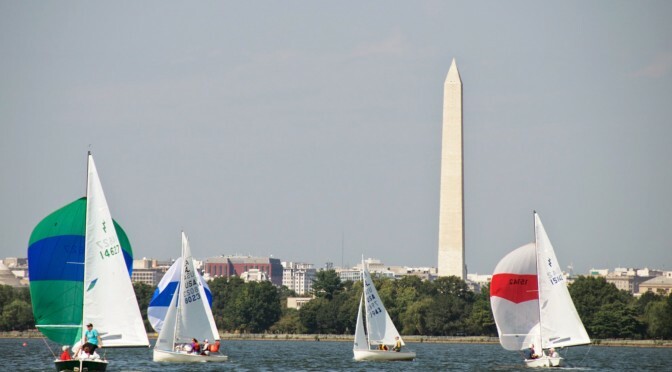 It was a pleasantly warm day on the Potomac with a good bit of breeze. 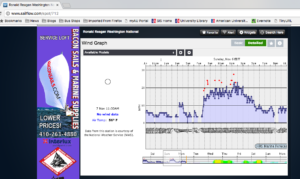 SailFlow shows winds in the high teens for most of our racing period with a few gusts in the high 20s. It turned out to be very nice with some good wind for planing and surfing. 3 races were held and the RC also organized a fun race back to the dock for beer! We had a great day for racing this past Sunday! Six Lightnings, two Bucs, two Albacores, and an I-20 came out to play on a sunny day that featured some great, albeit shifty, breeze. PRO Farley Will and his crew did a great job managing a “wacky west wind” in setting a course that gave us a mix of O2, T2, T3, and O3 courses. The wind reports from National Airport show a breeze of 12-15 throughout the afternoon with the occasional gust in the 20s. On board Beedobeat I was shorthanded, sailing with Piercarlo but no third. Given some of the tight reach angles (and a short-ish downwind leg due to the wind direction) we didn’t fly the spinnaker at all, but we were still right in the mix with the rest of the Lightnings, winning a few races and enjoying some great planing rides on the reach legs under jib and main alone (though we did have to work our butts off to keep the boat flat going upwind in some of te puffs!). Some of the Lightnings and Bucs did get their spins up, which mattered more on the Olympic courses with true downwind legs, I think. It wasn’t a guarantee, though, as I saw some boats struggle with controlling spinnakers in the puffs and shifts. The wind was not that crazy, though, and after 5 great races we headed back to shore for a BBQ under a wonderfully sunny (and warm!) fall sky. Scores will be posted soon, and I think we will also have some great photos taken from the RC boats to post as well. Stay tuned!